Sonic travellers, worthy citizens of the global village, their music travels through genres as diverse as Tribal, Kuduro, Dancehall, Hip Hop, Balkan and Cumbia but they prefer to call it “Global-Bass”. This duet with Latin roots and Scandinavian influence shows the newest mixtures of the world music. Danochilango, former dancer of The Royal Danish Ballet and DJ for more than a decade, create in his productions an harmonicbalance between the analogue and the electronic by the use of acoustic instruments. While Mambe conveys her activism through her vocals, she sings in Swedish, Spanish, Danish and English. Her melodic and powerful voice, bears a strong influence of her Colombian Roots, and her lyric fire words with a deep and profound social content. All of these qualities combined have led Mambe and Danochilango to be nominated for the Danish World Music Awards in the category of “Best live act 2015”. Moreover, “Cumbia Universal” has been nominated for “Best song 2016” by the same institution. The special connection between them became into an extraordinary faithful audience. They released the EP “Híbrido” in 2015. 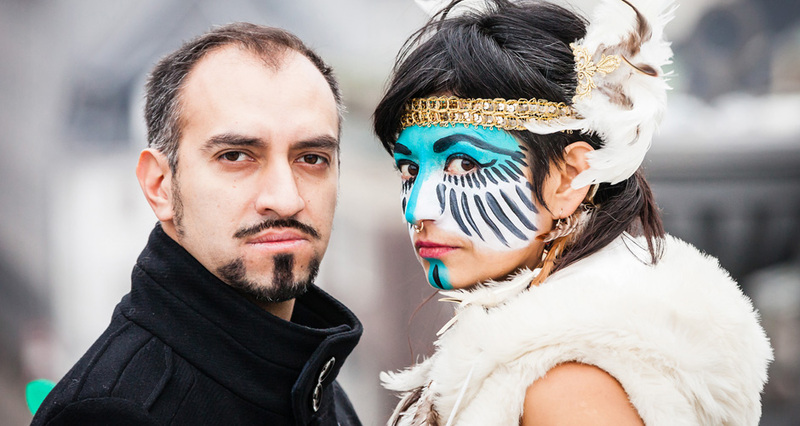 Since then, they have been sharing stages with bands such as Bomba Estéreo, Dengue Dengue Dengue, El Hijo de la Cumbia,Copia Doble Systema and Pato Machete to mention a few. After a fantastic first tour in Mexico, they are currently working on their new album, which is expected to be even more original, dance-able, urban and ethnically diverse than their debut EP. Immerse yourself into M&D universe!